Pharmacy Technology is a five-semester program, which combines classroom instruction with laboratory work and clinical experience to prepare students for employment as technicians. The pharmacy technician works under the supervision of registered pharmacists in hospitals, health care agencies, and retail outlets. Pharmacy Technology combines classroom instruction with laboratory work and clinical experience to prepare students for employment and advancement in the pharmacy field. Pharmacy technicians assist and support licensed pharmacists in providing direct patient care and medications to patients. Pharmacy technicians must work under the direction of a registered pharmacist. Students learn about pharmacology through an overview of drug classifications, common drug side effects, drug use and abuse, FDA testing, and biotransformation of drugs in the human body. The curriculum also includes therapeutic classification of drugs, generic and trade names, transcription abbreviations, and pharmacy math and dosage calculations. The program of study familiarizes the student with methods of drug preparation, packaging and distribution as well as the functions and services provided by the hospital and retail pharmacy. The program includes practical learning experiences in community settings. Pharmacy technician employers include pharmacies based in hospitals, retail settings, home health care, nursing homes, clinics, nuclear medicine settings and mail order prescription companies. Nontraditional employers for pharmacy technicians include medical insurance companies, medical computer software companies, drug manufacturing companies, drug wholesale companies, and food processing companies. Step 3 - Download and complete the Pharmacy Technology Application Information Packet. Step 4 - Have a composite ACT score of 17. Introductory course which gives an overview of the pharmacy technician career and opportunities open to certified pharmacy technicians. Topics discussed include professional literature, the pharmacist-technician relationship, pharmacy ethics, effective communication, brief history of health care, and pharmacy and hospital organization and department functions. The course is designed to introduce the student to the pharmacy technician program. One semester credit hour: One hour lecture. Legal aspects of pharmacy practice will be discussed including accountability, the Food and Drug Administration, the Controlled Substance Act, the Poison Prevention Act, OBRA ’90, HIPPA, and Mississippi State Law. Three semester credit hours: Three hours lecture. This course will enable the student to have a comprehensive understanding of pharmacy computer systems as well as give students hands-on operation experience. Two semester credit hours: Four hours lab. 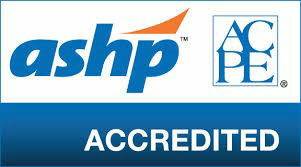 Prerequisite MAT 1234 - Instruction includes the proper use of the metric, apothecary, and avoirdupois systems. Conversion between the systems is mastered. Applications of formula, calculations of fractional dosages, percentage preparation, and methods of calculating dosages for all drug forms are studied. Review of calculations dealing with ratio and proportion, percentages, ratio strength, reducing and enlarging formulas and dilution, and concentration problems are presented. Three hours lecture. Three semester credit hours. This course is a study of body structure essential to safe and effective pharmaceutical care. Each body system is covered including applications to the field of pharmacy. Three semester credit hours: Three hours lecture. practice. Four semester credit hours: Four hours lecture. This course is a study of the concepts of design, preparation, use, and evaluation of solid and semisolid dosage forms. Specific topics include powders, tablets, capsules, coated dosage forms, suspensions, emulsions, magmas, gels, lotions, ointments, creams, pastes, suppositories, transdermal systems, sustained release products, and novel drug delivery systems. Exercises in computer application, prescription and physician order interpretation and the introduction of extemporaneous compounding are performed in the laboratory. Two semester credit hours: One hour lecture and two hours lab. functions and aseptic compounding and parenteral admixture, and use of computer database systems will be performed in the laboratory. Five semester credit hours: Three hours lecture and four hours lab. A study of human disease processes and rational pharmacokinetics relating to drugs for gastrointestinal and related diseases, renal system drugs, drugs for cardiovascular disease, drugs for muscle and joint disease, hormonal disorders and reproduction, topically applied drugs, ophthalmic and optic medications, chemotherapy, vitamins, electrolytes, nutrition and antidotes. Drug nomenclature is emphasized along with drug indications, contradictions, mechanism of action, side effects, dosage and methods of administration including how these principles can be utilized in pharmacy practice. Four semester credit hours: Four hours lecture. This course reviews the categories of the over-the-counter medications, explains the types and procedures of home monitoring equipment, and provides guidelines for patient counseling. Durable and surgical/nondurable medical products are explained. Highlights concepts of vitamins, herbs, and nutritional supplements, and the nontraditional treatment options. Four semester credit hours: Four hours lecture. This course includes the discussion of the concepts of obtaining pertinent patient information and data collection including patient medical record, patient interviews, drug use reviews, literature resources, and problem solving. Three semester credit hours: Two hours lecture and two hours lab. Application of the basic pharmacist technician concepts in community and hospital pharmacy, home health, and extended care settings. Emphasis is placed on functions associated with drug distribution system. Four semester credit hours: Twenty-four hours clinical. Progression of internship rotations in community, hospitals and medical centers or pharmaceutical manufacturers. Emphasis is placed on intravenous preparations, total parenteral nutrition, and chemotherapy preparations, and the use of controlled and investigational drugs in an institution. 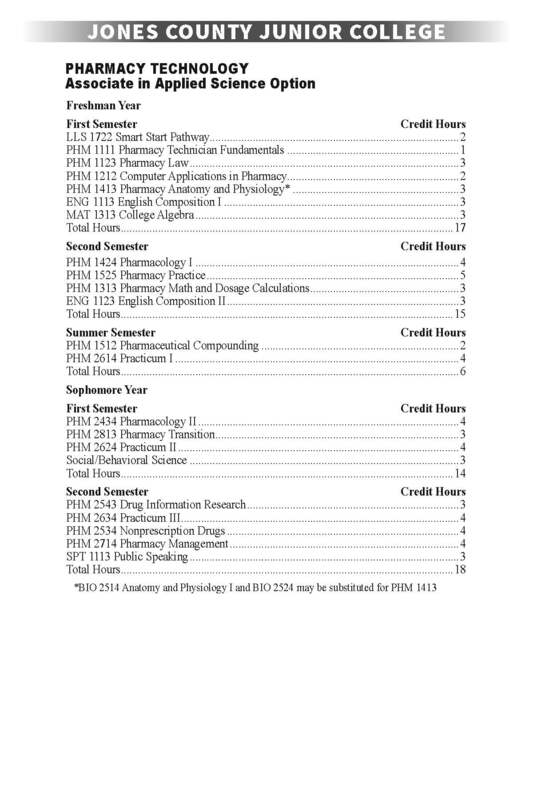 Four semester credit hours: Twelve hours clinical. Continuation of Pharmacist Technician Practicum II. Advanced level internship rotations in community, hospitals, medical centers, or pharmaceutical manufacturers. Emphasis is placed on intravenous preparations, total parenteral nutrition, and chemotherapy. Four semester credit hours: Twelve hours clinical. This course includes discussion of pharmacy functions relating to policies and procedures, drug purchasing, inventory control, drug recalls and returns, and maintaining transaction records. The class will explore several retail functions such as payments, billing, oral and written communications, computer data collection, and drug merchandising. Four semester credit hours: Four hours lecture. This course further develops decision-making skills and promotes an interest in continued professional development. Employment opportunities and responsibilities as well as preparation for the National Certification Exam are emphasized. Three semester credit hours: Three hours lecture.